The Matthew Micallef St John Athletics track at Marsa hosted over 300 foreign athletes for the European Team Championships Third League. The Malta Amateur Athletics Association was represented by a team of 40 athletes who were up against some the best competitors in this division. 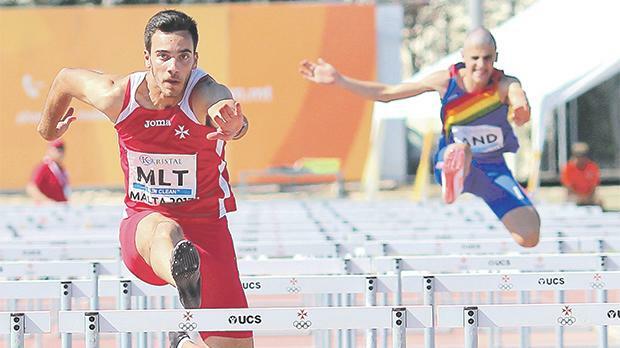 The two-day athletics bonanza saw a total of 53 events covering field and track disciplines and came to a nail-biting finish, where Malta narrowly missed out on third place and possible promotion to the second league – a position they were vying for until late Sunday afternoon. Nevertheless, the Maltese athletes gave a fine show, their fighting spirit having never waned throughout the weekend which saw temperatures rising and wind conditions rather strong at times. Malta faired quite well overall in the track competitions. Charlotte Wingfield continued to work her magic following on her success in the 2017 Games of the Small States of Europe in San Marino. The Cardiff-based sprinter dominated the 100m and 200m races, winning both and contributing full points for Malta. Wingfield then teamed up with Sarah Busuttil, Annalise Vassallo and Rachel Fitz to take second place in the 4x100m relay. Janet Richard placed second in the 400m race on Saturday and gave a strong performance in the 4x400m race when her final sprint saw her bring the team up from fourth to third place on Sunday. Lisa Marie Bezzina made up for her GSSE disappointment when she registered at time of 10 minutes 6.96 seconds in the 3,000m race. Fitz took second place in the 100 hurdles, a fraction of a second away from the first-placed Victoria Rausch, of Luxembourg. Roberta Schembri played good tactics in the 5,000 metres race to gradually close off in second place. Steve Camilleri, making a return to track events, joined the men’s 4x100m relay team, along with Julian Mifsud, Luke Bezzina and Omar Elaida to place second in 42.25 seconds. In the 100 metres, Bezzina dashed home third in 10.99 seconds while Charlton Debono settled for fourth place in the 5,000m race. Peppijna Dalli scored the first ten points for Malta on Saturday afternoon after she took top billing in the women’s pole vault, having jumped a height of 3.31m. In the triple jump, Rebecca Sare managed a best leap of 11.76 metres, 14 centimetres better than her effort at the San Marino GSSE where she had won the bronze medal, to finish fourth. Ian Paul Grech took third place in both the long jump and triple jump, registering a distance of 7.03m and 13.99m respectively. In the hammer, Mario Mifsud placed third with a throw of 47.61m, whilst Catriona Cuschieri took fifth place with a 34.59m effort in the discus. The Championships saw three national records being broken, two of which had been established in the nineties. Daniel Saliba knocked off Sean Camilleri’s twenty-two-year-old record in the 110m hurdles when he clocked a time of 15.87. Saliba’s time saw him take third place. Andrew Cassar Torregiani broke the long standing high jump record, established by Edward Calleja in 1998 when passing the 1.90m mark. In the 3,000m steeplechase, Monalisa Camilleri, broke her own mark established during the 2015 European Games in Baku. Camilleri placed third in 11 minutes 19.6 seconds. Whilst the Maltese flag featured consistently in second place throughout the competition, it was in the final events of the weekend that saw Bosnia and Georgia pip Malta to possible promotion and third place. Although only half a point separating Malta from Georgia might be a bit of a bitter pill to swallow, the results produced by Maltese athletes over the weekend should not be dismissed. Maltese athletes have shown a lot of commitment and there is potential to be tapped,” MAAA president Edwin Attard said.